Directions: Being on I-64 East, Exit 220, go approximately 35 miles to Deltaville. Sale site on left. Watch for auction signs. Massey Ferguson 7620 Dyna-VT, SN-C192062, powered by 180 hp 6-cyl. diesel, TUT transmission, differential lock, ps 540/1000 shift-on-the-go pto, (4) sets dual remote hydraulic outlets, cab w/air & radio, 16.9R28 front tires, 480/R42 dual rear tires, front weights, 469 hours, good rubber, like new condition. Massey Ferguson 4263, SN-F4311, powered by 100 hp 6-cyl. 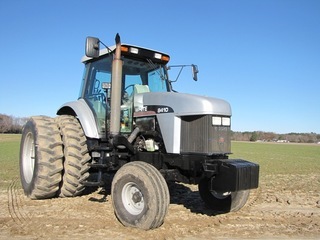 diesel, 8-speed Hi-Lo transmission, differential lock, ps, 540/1000 shift-on-the-go pto, (2) sets dual remote hydraulic outlets, cab w/air & radio, 11.00-16 front tires, 16.9-38 rear tires, front weights, 2957 hrs., good rubber. Massey Ferguson 135, SN-641006486, powered by 45 hp 3-cyl. 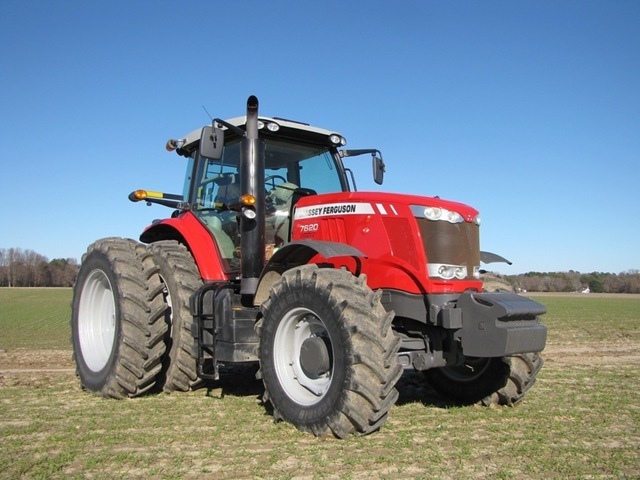 diesel, 3-speed Hi-Lo transmission, 540 pto, 6.50-16 front tires, 13.6-8 rear tires, 2634 hrs. showing, good rubber, engine completely rebuilt less than 100 hours, good condition. White 8410, SN-G056003, powered by 145 hp 6-cyl. diesel, 32-speed Hi-Lo Quadra-Shift transmission, differential lock, 540/1000 shift-on-the-go pto, (3) sets dual remote hydraulic, cab w/air & radio, 11.00-16 front tires, 18.4-38 dual rear tires, front weights, 2978 hrs., good rubber, good condition. John Deere 7600, SN-RW7600P001862, powered by 124 hp 6-cyl. diesel, 19-speed powershift transmission, differential lock, ps, 540 shift-on-the-go pto, (3) sets dual remote hydraulic outlets, cab w/air & radio, 10.00-16 front tires, 18.4-38 dual rear tires, front weights, 1360 hrs., very clean, good condition, take a look @ the low actual hrs. Super A Farmall, SN-33198, 4-cyl. gas, 4-speed transmission, 540 pto, cultivators, fertilizer attachment, 5.00-15 front tires, 11.2-24 rear tires, good rubber, rear wheel weights, good condition. Gleaner R42 combine, SN-R4246001, 6-cyl. diesel Cummins, 4345 engine hrs., 3750 separator hrs., hydro transmission, rotor has 1 season, 24.5-32 front tires, 12.5-24 rear tires, cab w/air & radio. 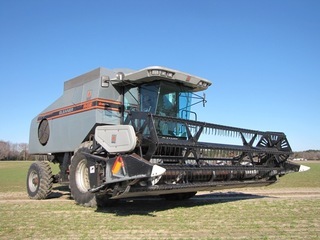 Gleaner R62, 4×4, combine SN-R6266161, 6-cyl diesel engine, , 4276 engine hrs., 3282 separator hrs., 800/65R32 front tires, 16.9-26 rear tires, cab w/ac & radio. Agco 500 18’ grain head, SN-1840354F, SCH cutter bar. Agco 630 Corn Head (Hugger), SN-063014703F9190. Unverferth HT25 Header cart, 20.05-10 tires, 26’ long, w/lights. Kelderman header attachment for down corn. Clark GPX30 fork lift, SN-GPX230-0447-8890KOF, 4-cyl. gas engine, 7:00-12 dual front tires, 6.50-10 rear tires, canopy, 3-stage mast, 14’ lifting height. Clark C40B fork lift, 4-cyl. gas engine, SN-790224, solid tires, 3-stage mast. ’06 IH 8600, 6-cyl. Cummins MII diesel, 10-speed transmission, cab lights ps, air brakes, am-fm radio, west coast mirrors, 295/75R228 Budds, 200-gal. fuel capacity, tandem axle, 187” wheel base, 447,434 miles, air ride seat, very nice condition. ’91 White/GMC/Volvo semi road tractor, 6-cyl. Cummins L-10 diesel engine, 9-speed transmission, cab lights, ps, air brakes, am-fm radio, west coast mirrors, 11R22.5 Budds, 200-gal. fuel capacity, single axle, 146” wheel base, unknown miles, wet line, good condition. ’87 Mercedes 1219, w/96” x 18’ flatbed, 6-cyl. diesel, 5-speed transmission, cab lights ps, air brakes, am-fm radio, west coast mirrors, 10R225 Budds, 75-gal. fuel capacity, single axle, 168” wheel base, 100,510 miles, tool boxes, good condition. ’88 IH S1900, 10-wheeler, 6-cyl. DT466 diesel engine, 5-speed transmission, 2-speed rear axle, cab lights, ps, air brakes, am-fm radio, west coast mirrors, 11R22.5 Spokes, 160-gal. fuel capacity, tandem axle, 22’ body w/ 54” grain sides, 261” wheel base, 257, 005 miles, steel floor, very good condition. ’88 IH S1900,10-wheeler, 6-cyl. DT466 diesel engine, 5-speed transmission, 2-speed rear axle, cab lights, ps, air brakes, am-fm radio, west coast mirrors, 11R22.5 Spokes, 160 gal. fuel capacity, tandem axle, rear lift axle, 18’ twin cylinder dump w/56” wood grain sides, 228” wheel base, 278, 105 miles, steel floor, very good condition. 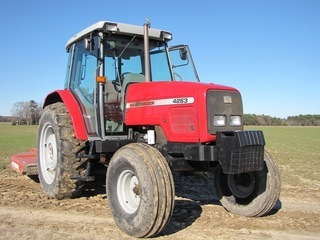 ’91 IH 4900 10-wheeler, 6-cyl. DT466 diesel engine, Allison automatic transmission, cab lights, ps, air brakes, am-fm radio, 11R225 Spokes, 75-gal. fuel capacity, tandem axle, 20’ dump body with 4’ wood sides, 240” wheel base, showing 28,644 miles, good condition. ’04 Chevrolet Express cargo van, 8-cyl. gas engine, automatic transmission, ps, power brakes, am-fm radio, below eye level mirrors, LT245/75R16 tires, single axle, 12’ body, 140” wheel base, 272,450 miles, good condition. ’99 Chevrolet 2500 w/Knapheid service body, 8-cyl. gas engine, automatic transmission, ps, power brakes, am-fm radio, below eye level mirrors, LT245/75R16 tires, single axle, 8’ body, 132” wheel base, 167,165 miles. ’88 IH 8300, 6-cyl. L-10 Cummins, 9-speed transmission, cab lights, ps, air brakes, am-fm radio, west coast mirrors, 11R22.5 Budds, 260-gal. fuel capacity, tandem axle, 180” wheel base, 466,090 miles, good condition. ’84 IH 4700 w/Morgan 16’ delivery box w/Thermo King cooler, 6-cyl. DT-360 engine, 5-speed transmission, cab lights, ps, power brakes, am-fm radio, west coast mirrors, 11R22.5 Budds, 150-gal. fuel capacity, single axle, 205” wheel base, 480,325 miles, rear roll-up door, good condition. ’06 GMC Canyon , 4×4, 5-cyl gas engine, automatic transmission, 235/75R15 tires, 176,000 miles, Reese hitch, sunroof, crew cab, tool box, loaded, very good condition. ’11 Carry-On 20’ x 86” tandem axle trailer, 2’ beavertail w/ramps, 2 5/16” ball hitch, 235/85R16 tires, electric brakes, tool box, good condition. ’80 Tonco Tag-Along 20’ x 8’ tri-axle trailer, Pintle hitch, 9-14.5 tires, 18,000 GVW, 4’ beavertail w/ramps. ’91 Pines 53’ x 102” van, 5th wheel hitch, 295/75R22.5 tires, rear roll-up door, good condition. ’73 Fruehauf 40’ x 93” grain trailer, tandem axle, 4’ grain-wood sides, 5th wheel hitch, 11R22.5 tires, canvas roll-top, Shur-Lok. ’72 Fruehauf 40’ x 93’grain trailer w/4’ wood grain sides, tandem axle, 5th wheel hitch, 11R22.5 tires, canvas roll-top, new brakes and drums. ’83 Southwest 30’ x 90” grain trailer w/4’ wood grain sides, tandem axle, 5th wheel hitch, 11R22.5 tires, roll-top canvas, heavy duty, good condition. ’84 Chamberlin 42’ x 96” hopper bottom trailer, tandem axle, 60” metal sides, 5th wheel hitch, 11R22.5 tires, Shur-Lok canvas, new brakes and drums, good condition. Tag Along 11’ x 78” trailer, tandem axle, half metal rack sides, 2” ball hitch, 78/14” tires, shop made, bill of sale, good condition. Kifco T200L waterreel,Honda 270 gas engine, w/Twin-Max gun, 2” line. Deutz irrigation pump, 4-cyl diesel engine Rainbow pump, 4627 hrs., 6” & 4” out, mounted on trailer, bumper pull. Flo Guard 30” sand filter system mounted on pressure treated lumber. Rain-Flo irrigation w/Berkley pump powered by Vanguard 16 hp 2-cyl gas engine. Rain-Flo 1600 vegetable transplanter, SN 4457, 3-pt. Monessen 4-row seed planter, 540 pto, Yetter row cleaner, 3-pt. Taylor butter bean sheller, SN-520BC2159, w/multiple screens, 220 electric. Lockwood grader, 56’ long, 110 electric motor washer. TEW vegetable grading line w/washer, 110 electric. Jacto AJ401 canon sprayer, 540 pto, 3-pt. Pixall shaker table, 110 electric. Pixall 1-row string bean & butter bean picker, 540 pto, pull type, completely rebuilt. Rain-Flo 2250 plastic mulch layer, Series II, 3-pt. Strickland 1-R-28-60 sweet potato flip plow, 3-pt. Ferris w/poly planter, w/1-row Monessen planter, (plant seed thru plastic), 3-pt., 540 pto. McFarlan drag harrow, trailer type, 20’ wide. (2) Vanguard VM-2600 seed monitor. Large quantity of drip irrigation fittings & pressure regulators. 3” black main line lay flat pipe. 4” blue main line lay flat pipe. Mechanical Mdl. 22C 1-row l transplanter, 3-pt. Pallet of 4’ plastic mulch. 5/8 field baskets (approx. 500). 1-bushel field baskets (approx. 80). Single door cooler w/glass door, 110 electric (Beverage). (2) pallets of corn boxes. (3) pallets of Strawberry flats. (2) pallets of tomato bottoms & lids. Pallet ½ bushel squash boxes. John Deere 8’, 28-blade finishing disc, 7” spacing, trail-type..
Great Plains 1800TT turbo till, 18’, hydraulic wing fold, new blades by Selective. DMI 2500B 4-shank ripper, no-till, w/Berm tucker wheels, 3-pt..
Ferguson 10-shank chisel plow, 11’, 3-pt. John Deere 2350-2450 6-bottom on land 16” bottoms, semi mount, good condition. John Deere 7000 no till 12-row 30” spacing planter. (2) UFT 5315 no till drill, 7 ½ ” spacing, hydraulic row marker. John Deere 7000 6-row, 30” no till planter, born/bean. A/C 4-row no till planter, dry fertilizer w/row markers, set up for snap beans. John Deere 7000 no till planter for parts. John Blue 400 gal. stainless steel tank sprayer, 34’ booms, w/foam markers, ground driven, pull type. Great Plains TXF660, 650-gal. poly tank sprayer, 60’ booms, handwash & rinse tank, foam markers w/Great Plains controls. Speedy-Spread 504 by General Metals, 540 pto, ground driven. Friesen 220 bu. seed tender, Honda 5 hp gas, electric start, SN-3760. Clipper seed cleaner, 110 electric. New Holland 180 gravity flow box on New Holland 450 4-wheel running gear. Little Grant gravity flow on 4-wheel running gear (looks to be approx. 180 bu.). 4-Wheel 16’ x 8’ wagon w/8” sides. 18’ x 7’ single axle trailer, pin hitch, wood floor. 25’ x 8’ tandem axle trailer, shop make, 235/75T15 tires, pin hitch. 16’x 7 ½’ tandem axle trailer, pin hitch, wood floor, 225/75R15 tires. 16’x 7’ tandem axle trailer, pin hitch, wood floor, 8-14.5 tires. John Deere L130 lawn tractor, 23 hp Kohler 48” cut, w/2 bag bagger. Bush Hog 2715 wing fold rotary cutter, 540 pto, 15’, solid tires. Troy-Built Horse rototiller, 7 hp gas engine, w/new cultivator tines. Artist Hand sheet rock lift. Helix hydraulic seed auger, 13’ long x 6”. Brillion stalk shredder, 15’, 1000 pto, new knives. Westfield seed auger, 6”, was last on back of 10-wheeler truck. Englo air compressor, 8 hp Kohler gas engine. 280 Gal. stainless steel fuel tank w/12-volt pump. Drill press, 16-speed heavy duty, bench model. Auctioneer’s Note: Complete liquidation, farm has been rented. The Crittenden’s have farmed @ this location since 1929. Equipment has been well maintained, serviced on regular intervals, 90% shed kept. You will like what you see when you arrive. Bring your traveling buddy – makes your traveling time go by shortly. For more info call Tyler @ 804-694-9135. 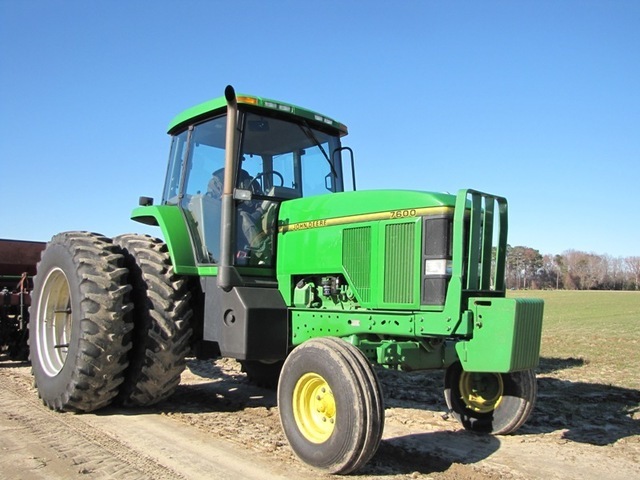 1967 John Deere 2020 row crop tractor, SN-047303T, 4-cyl diesel, 8-speed transmission, ps, 540 pto, 2680 hrs. showing.. open station,6.00-16 front tires (50%), 14.9-28 rear tires (90%), power adjust wheels, remote hydraulic, condition average w/original paint, used daily. 1965 John Deere 3020 row crop, SN-T113R075295R, 72 hp 6-cyl. diesel, 8-speed synchro-range, 540 & 1000 pto, open station, 24-volt charging system,, 11L-15 front tires (50%), 15.5-39 rear tires (90%), new rims, remote hydraulic outlet, slab weights, original paint, used daily. 2521 hrs. showing. Rainflo Mdl 2600 plastic mulch layer w/drip tape option, 3-pt., used very little. John Deere Mdl 910 7 shank v-ripper. 30” rows, 3-pt. Walk in cooler free standing dimensions 8’w x 12’L x 8’ tall, 115 volt, unit inside, needs compressor. Woods RM59 finishing mower side discharge, 3-pt. excellent condition. (8) 14.5 tire, new, mounted on rims.